Special Counsel Robert Mueller essentially gave Michael Flynn a free pass tonight, citing Flynn’s overwhelmingly helpful cooperation in the Trump-Russia scandal. This is, to put it bluntly, the worst possible news for Donald Trump. If you want confirmation of this, look no further than the reaction of Trump’s criminal defense attorney. Back in the real world, Flynn conspired with the Russian government to sabotage the United States government, which is somewhere between conspiracy against the United States and treason. Rudy’s decision to go outright bonkers with delusional nonsense, instead of even trying to argue the merits of the case, is a clear sign that Rudy knows just how bad this is for Donald Trump. So what now? Robert Mueller made this move tonight, knowing that it would send Donald Trump and everyone around him into a paranoid panic. Now he has two more bombs to drop on Friday when he files the sentencing memos for Michael Cohen and Paul Manafort. Mueller appears to be trying to create chaos within Team Trump, so they’ll trip over each other and take each other down. 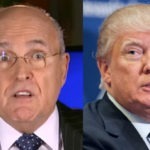 Rudy Giuliani’s unhinged response suggests it’s already working.